Úna Monaghan will release a new album, named “For”, on 26th January 2018. 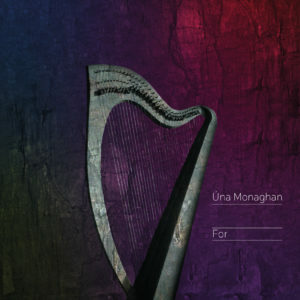 Twelve original tracks for harp and electronics – an album that combines traditional music, experimental music, improvisation, electroacoustic composition and live electronics. The night will begin with an excerpt from “Owenvarragh, a Belfast Circus on The Star Factory”. This is a recent production featuring multiple traditional soloists and a soundscape of field recordings, created from a book by Ciaran Carson and a 1979 score by John Cage. After a harp + electronics set from Úna, Paddy Glackin will perform Úna’s piece for fiddle and electronics “Who Do You Play For?”, featuring the writing of Cathal Ó Searcaigh and Ciaran Carson. Session to follow, in the Book Bar, upstairs at Accidental Theatre.